To celebrate our Anniversary, I made this Cheesecake few days back. 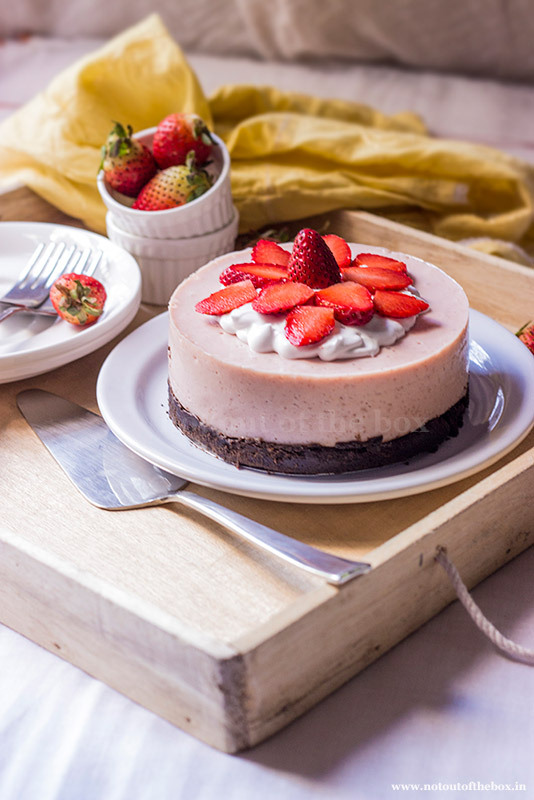 To make this simple no bake Cheesecake you can use any other fruit pulp of your choice. 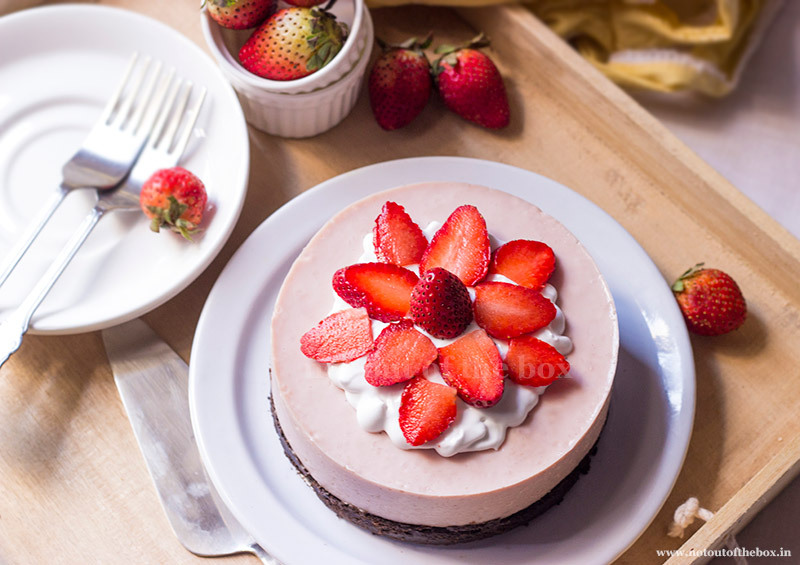 I used strawberry cause it’s a family favorite fruit. So here is the simple and no fuss recipe for an amazing dessert! 1. Add 5-6 fresh strawberries in a mixer/grinder. Grind till smooth. Keep aside. 2. For the base grind oreo cookies and butter using a mixer, until a fine mixture forms. Spread this mixture evenly on the base of your 6″ spring form cake tin/loose bottomed cake tin. Keep it in the refrigerator for minimum 20 minutes. In between make the filling. 3. For the filling add strawberry pulp, condensed milk and paneer into a mixer, grind until a smooth paste forms. Mix gelatin with water (the water I used was in room temperature), stir well to make a lump free mixture. Keep aside for 10 minutes. Pour the dissolved gelatin into mixer, and grind further until a smooth lump free batter forms. 4. Take out the cake pan from the refrigerator and pour this mixture on the base. Run the spatula over the top to even out the surface. 5. Now chill the cheesecake for minimum 10-12 hours or more in the refrigerator. It will set well within this time. After that unmold, cut, serve and enjoy! I decorated the top with whipped cream followed by some fresh strawberries. You can design the top with fresh fruits, grated chocolate or anything else of your choice, options are endless. This recipe can be easily doubled. If you are doubling the recipe then use an 8″ spring form cake pan/loose bottomed cake tin. Use Agar agar instead of Gelatin in the same quantity for a vegetarian version. What can I use instead of gelatin? Am a vagatarian. Replace gelatin with Agar agar in same quantity. Hi, Can I use cream cheese instead of using paneer and gelatin?